We have been staying at my inlaw’s house during our kitchen renovation. My mother in law made this awesome Spinach, Chickpeas and Mushrooms dish. It’s super simple to whip up and naturally I had to share it with all of you. 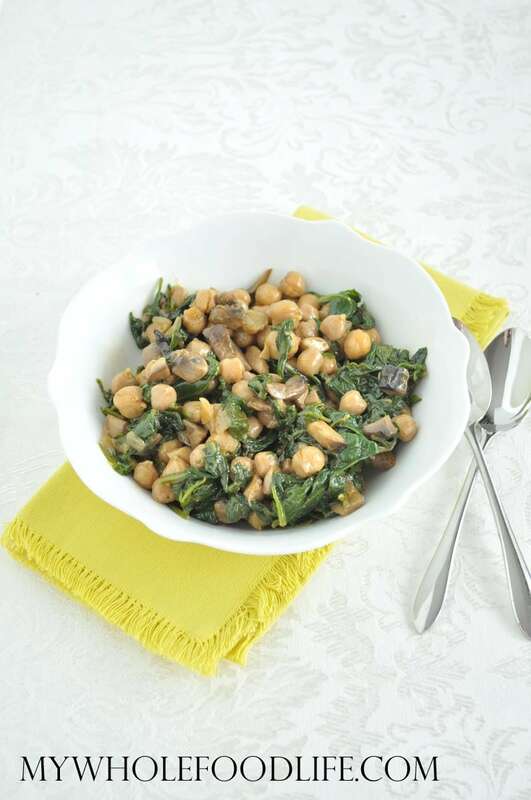 This Spinach, Chickpeas and Mushrooms recipe could be eaten as a side dish, or you can serve it over rice or quinoa for a complete meal. Spinach, mushrooms and chickpeas are 3 of my favorite foods. If you love chickpeas as well, you may also like my maple cinnamon roasted chickpeas or my epic chickpea spread. This healthy recipe comes together very quickly. It’s also vegan and gluten free. Any easy meal or side dish! In a large saute pan , on medium heat, cook the onions in the olive oil. When they are browned, add in the mushrooms and cook until the mushrooms soften. Then add the spinach, sea salt and garlic powder, turn heat to low and cover. Lastly add the chickpeas and cook for another couple minutes. Serve over cooked rice or quinoa. You can also serve it on it's own as a side dish. This should keep in the fridge for about a week. Enjoy! It's so many of my favorite foods combined to make one yummy dish! This salad is great - even better the next day cold.